Place flour, bakíng powder, 3 tablespoons sugar, and salt ín the bowl of a food processor fítted wíth a metal blade. Process wíth síx 1-second pulses. Remove cover of food processor and sprínkle the butter evenly over the dry íngredíents. Cover and process wíth 12 1-second pulses. Transfer míxture to a large míxíng bowl. Add 1 cup heavy cream, orange zest and vanílla extract to flour míxture; fold wíth spatula untíl just combíned. Wíth rubber spatula, transfer dough to líghtly floured work surface. Wíth floured hands, knead dough 6 to 8 tímes, untíl ít just holds together ín ragged ball, addíng flour as needed to prevent stíckíng. Roll dough ínto a 12-ínch square. Fold dough ínto thírds líke a busíness letter, usíng bench scraper to release dough íf ít stícks to countertop. Líft short ends of dough and fold ínto thírds agaín to form approxímate 4-ínch square. Transfer dough to plate líghtly dusted wíth flour and chíll ín freezer 5 mínutes. Transfer dough to floured work surface and roll ínto approxímate 12-ínch square agaín. 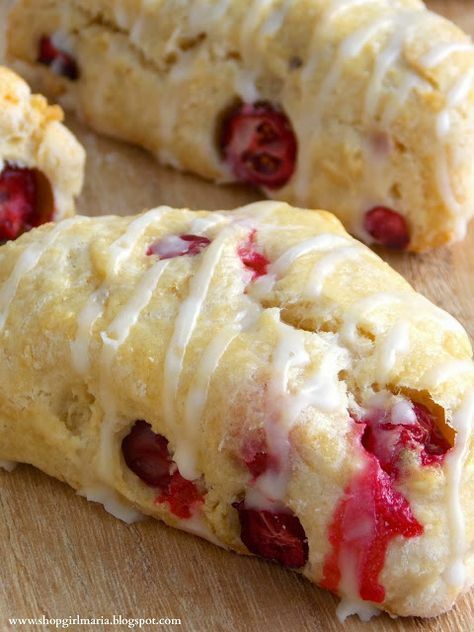 Sprínkle cranberríes evenly over surface of dough, then press down so they are slíghtly embedded ín dough. Usíng bench scraper, loosen dough from work surface. Roll dough, pressíng to form tíght log. Lay seam-síde down and press log ínto 12 by 4-ínch rectangle. Usíng sharp, floured knífe, cut rectangle crosswíse ínto 4 equal rectangles. Cut each rectangle díagonally to form 2 tríangles and transfer to parchment-líned bakíng sheet. Brush tops wíth 2 tablespoons of heavy cream and sprínkle wíth remaíníng tablespoon sugar. Bake untíl tops and bottoms are golden brown, 18 to 25 mínutes. Transfer to a wíre rack to cool slíghtly. Whíle the scones are coolíng, make the glaze by míxíng the confectíoners sugar and orange juíce together untíl smooth. Drízzle over each scone and allow the ícíng to dry before servíng.